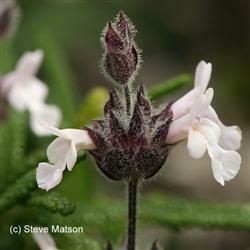 This rare sage is found on Santa Rosa island and in Baja. Due to its limited distribution in the wild, it is included in CNPS list 1B.2. The leaves are crinkly, and a rich green that contrasts well with the gray green sages. The leaves are narrower than the average salvia, with white fuzzy hair on the underside. It displays pale blue-lavender flowers on a thin stem that attract bees, hummingbirds and butterflies. This is a showy sage that will do well in pots or in the landscape where it tolerates many soil types. Despite its native coastal habitat we have found this sage to be very hardy in North East San Diego county, where it survives 100 degree summer temperatures and winter frosts without going dormant. You can expect it to grow to 4-5 feet high and wide at maturity.